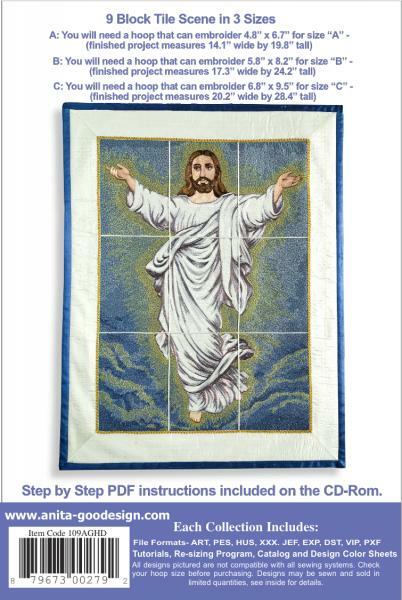 After the release of our Nativity tile scene in October 2008, we received numerous requests from our customers all around the country for more Christian themes. After discussing a wide range of topics and choices we decided on creating a tile scene for the Ascension with Jesus rising to heaven. There are hundreds of reference paintings for the Ascension and instead of showing a complete scene with the apostles, we decided to show only Jesus rising through the clouds. The reason for this was that we wanted to add a lot of detail to Jesus and to do this we wanted to make him as large as possible. We added a lot of detail to the face and eyes of Jesus and the overall design, once embroidered this tile scene looks just like a painting. This is a nine block tile scene that comes in three different sizes, a small size for the 5"x7" hoop a medium size for the 6"x10" hoop and a large size for the 7"x12" hoop. We added some features into this design; the entire cloud background was created with hand stippling in multiple colors. The stippling was created with different densities so that the background has a beautiful layered look but still allowing the emphasis to be placed on the image of Jesus.